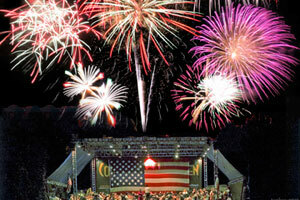 The Dallas/Fort Worth area has many great activities planned to celebrate Independence Day. From parades to concerts to barbecues, you’re sure to get your fireworks fix this fourth. 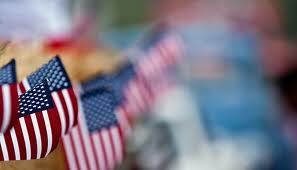 Here is an extensive list of all the 4th of July celebrations going on in 2014 around the Dallas/Fort Worth area. DFW residents are blessed to have so many great options for celebrating America’s Birthday. Time: 4 p.m. Fireworks at 10:05 p.m. Location: Celebration Park, 701 Angel Pkwy., Allen, TX 75002. Music, food, fireworks, kids activities and more. Radio Disney LIVE! Kelli Berglund from Disney XD’s “Lab Rats” and Dylan Riley Snyder from Disney XD’s “Kickin It.” Then it’s ChinaTown, Pentatonix, and 4Troops. The night caps off with Allen’s massive fireworks show which gets bigger and bigger each year. 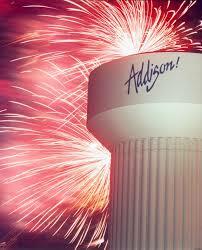 July 3: Addison – Kaboom Town! Kaboom Town! celebrates Independence Day with a festival beginning at 5 p.m. Food, music, kid’s activities including rock climbing, giant slide, fun inflatables, sand art, free movie, and an obstacle course. The dazzling 30-minute fireworks show is choreographed to music and a live radio simulcast on 100.3 JACK FM. This event is FREE. Time: Fireworks at 10 p.m. Activities all day long. The City of Bedford will celebrate Independence Day with 4thFEST, a free celebration featuring live music, a variety of themed family-friendly activities, a birthday themed classic car show, yummy festival food and of course the spectacular fireworks when the sun goes down. 4thFEST visitors can also take a dip in Bedford’s Splash Aquatic Center, featuring three unique pools with several water slides, a kids’ play area, umbrella-shaded leisure patios and a cabana party pavilion. Admission to the Center is $6.50/adults, $5.50/kids. Admission to 4thFEST is free. Feel free to bring lawn chairs, blankets, coolers and non-alcoholic beverages (No glass containers). Time: 5:30 p.m. music begins at 6:30. Fireworks at dusk. This year Denton County’s event will move to UNT’s beautiful new Apogee Stadium so come on out for live music, followed by an awesome array of fireworks that light up the sky. The event is free but donations are gladly accepted by the energetic “Bucket Brigade” before, during, and after the show. Time: 10:00 a.m. to 10 p.m. Fireworks at 9:30 p.m. in the Cotton Bowl. Location: Fair Park, 1300 Robert B. Cullum Blvd., Dallas, TX. Enjoy live music, water features and access to rides, games and concessions within the State Fair of Texas Midway, starting at noon on July fourth. Admission to the Midway is $5, or complimentary to those who participate in the Dallas Park and Recreation “Dallas 7/4” race (7k/4k) that morning. Approximately 26 exhilarating rides will be available on the Midway. Ride and game costs will vary. Time: Gates open at 5 p.m.. 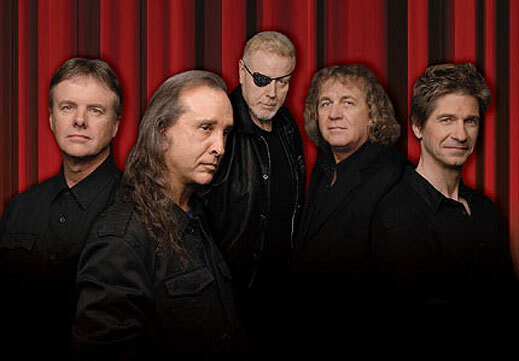 Headlined by KANSAS, which celebrated its 40th year as a band last year, Independence Fest 2014 will continue to build on the success of previous years to be a great day of celebration, and as always, admission and parking are FREE. A full day of activities begins with our annual Children’s Parade at the LISD School Administration Building, 1800 Timber Creek Road, and concludes with a fantastic fireworks finale at around 9:50 p.m. that follows the free concert featuring KANSAS at Bakersfield Park. Independence Fest 2014 will also host performances by other musical groups including Back in Black and Breaking Southwest; plus a vintage car show presented by Time Machine Car Shows, a showcase of our local businesses, food and drinks for the whole family, and a completely FREE Kid’s Zone complete with bounce houses, face painting, and more. The Children’s Parade will take place from 10 a.m. – 1 p.m. at the LISD School Administration Building; with line-up beginning at 9:30 a.m. There will be hot dogs prepared by The Summit Club, Clowns, Bouncehouses, slides, vendors, and more. Please visit the Children’s Page for more information. Enjoy live music by Groove Knight begins at 6:45 pm. Fireworks on at approximately 9:30 pm. In the KidZone children are sure to have fun getting their face painted, going down the giant inflatable slide, bouncing in the bounce houses, getting a custom twisted baloon, and showing their masterpieces in chalk on the sidewalk. Don’t miss the pie eating contest where prizes will be awarded to the top 3 winners in each category. Location: Billie Bob’s Texas, Fort Worth Stockyards. Willie Nelson’s 4th of July Picnic is coming back to the Fort Worth Stockyards. Willie takes the Main Stage at 11 p.m. Don’t miss Willie Nelson, Jamey Johnson, David Allan Coe, Ray Wylie Hubbard, Kris Kristopherson, Gary Allan, Randy Rogers Band and more. Tickets: $40 General Admission Advance Purchase, $60 General Admission Day of Show. Purchase tickets here. This is an indoor/outdoor event located on Rodeo Plaza in the Historic Fort Worth Stockyards. 17 and under must be accompanied by a parent or legal guardian. No chairs, umbrellas, pets, coolers. Time: 2 p.m. Live music 6-9:30 p.m. Fireworks at 9:30 p.m. Location: 395 Purcey Street, FW Texas 76102. Fort Worth’s 4th is moving back to its original home. Free music and family activities along the Trinity River at Panther Island Pavilion in Trinity Uptown. Activities include live music, a water slide, tubing and kayaking on the Trinity River, a bounce house, mini golf and an obstacle course. 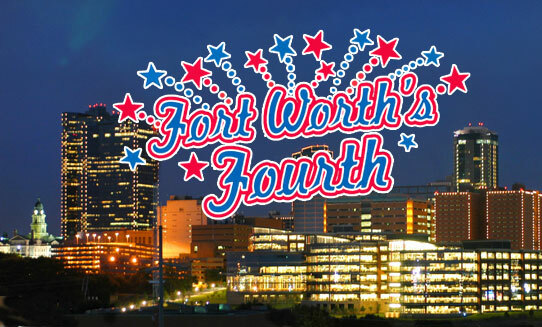 Don’t forget to bring your blankets and lawn chairs for front row seats to Fort Worth’s biggest firework display at 10 p.m.
One of Fort Worth’s favorite traditions! Celebrate Independence Day in true patriotic fashion with thrilling marches, heartfelt military salutes and the most spectacular fireworks show in town. This is one of our most popular concerts, so order your reserved table or general admission lawn tickets today! Time: Starts 4 p.m. until the fireworks finale. Party in the Plaza will include all the traditional makings of Frisco Freedom Fest beginning at 4 p.m. New this year: a zip line! The Children’s Expo features two Euro bungees, a rock climbing wall and bounce house inflatables. The plaza party also includes a Community Stage, featuring local entertainers, and Hometown Hero Exhibit, showcasing our police and fire departments. The Taste of Frisco returns with Frisco restaurants will be serving some of their most popular menu items. Time: 5 p.m. Fireworks at 9:30 p.m. Location: Hurst Community Park, southwest corner of Precinct Line and Pipeline Roads. It’s the Stars & Stripes festival in Hurst on July 4th. The event will be held between 5 p.m. and 10 p.m. The Children’s Area will be located on the West Lawn, featuring large inflatable activities. Music starts at 5:30 p.m. Fireworks at approximately 9:30 p.m. at the Hurst Community Park. A free shuttle service will be available from North East Mall. No pets, RV’s or trailers allowed. Location: McKinney Soccer Complex at Craig Ranch. The Hometown Parade begins at 10 a.m. in historic downtown McKinney. Family activities and food from 7 p.m. to 9:30 p.m. Live music from 8 p.m. – 9:30 p.m. WRR will provide “Sounds of America” on a live simulcast during the fireworks on Classical 101.1. Be sure to tune in as you watch the McKinney fireworks show beginning at 9:45 p.m. For more information on the activities at the McKinney Soccer Complex at Craig Ranch call 972-547-7480. All Red, White and BOOM! activities are free and open to the general public. Alcohol is not allowed. Celebrate America’s independence with an evening of fun, games, music and fireworks in the Las Colinas District of Irving. The Family Fun Zone will feature bounce houses, inflatable slides, a rock climbing wall, rides and more. Bring your appetite to Eats and Treats Alley, a food court with options to suit every taste. The professionally choreographed fireworks show is scheduled to begin at approximately 9:40 p.m.
32nd Annual Fireworks Extravaganza. Be prepared to be astonished by the fireworks spectacular, which can be viewed from any lakeside location as well as several other spots throughout Grapevine. Red White & Lewisville Fireworks Display. The spectacular fireworks show will start shortly after dark at approximately 9:30 p.m. The best viewing opportunities will be on the South side of Vista Ridge Mall and along the 121 Bypass. 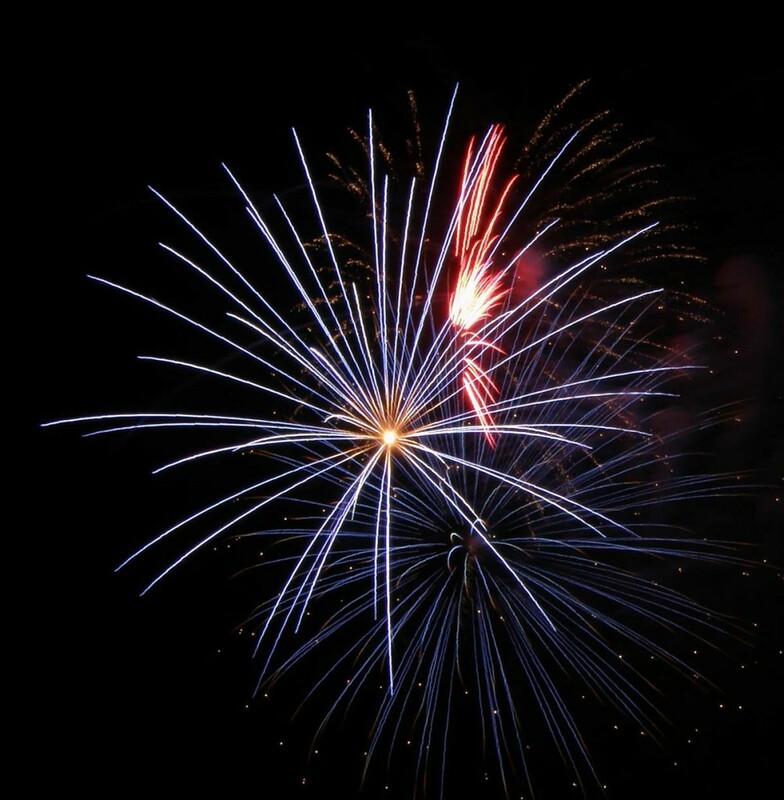 Time: Friday, July 4, 2014 from 5 p.m. until approximately 10 p.m.
On the shores of Lake Lewisville, the Town of Little Elm will host July Jubilee. This family-oriented celebration will include live Music, food trucks, vendors and the evening will conclude with a spectacular fireworks display over the lake. Time: 6:00 p.m. to 10:15 p.m. Fireworks start at 9:45 p.m.
Sparks will fly at the City of Richardson’s annual “Family 4th Celebration” on Wednesday, July 4, 2014 at Breckinridge Park. This traditional, patriotic salute is free and open to the entire community. Attendees are encouraged to bring picnics, blankets and/or lawn chairs and enjoy the evening under the stars! Time: Thursday, July 3, 2014; Fireworks at 9:30 p.m.
Join us for an evening of family fun, great food, patriotic music, and great fireworks! It all takes place on Thursday, July 3rd, 2014 at 6 PM, in beautiful Southlake, Texas! Candy Art, Balloon Artists, gourmet food trucks and more. Time: Friday, July 4, 2014; Fireworks at 9:30 p.m. The 27th Annual Liberty by the Lake festivities begin at 7:45 a.m. with a one-mile run followed by 5K and 10K runs. The annual parade starts at 10 a.m. Back again for another year the high flying talents of Lone Star Action Sports – BMX Stunt Show. Performances at 5 pm, 6:30 pm and 8 pm. The fireworks are scheduled to begin at 9:30 pm on July 4th. The shoot site for the 2014 show will be from the tip of the Stewart Peninsula Golf Course, making Stewart Creek Park the prime viewing area for the show. The fireworks will be shot right over Lake Lewisville, creating a beautiful display of colors. The fireworks are choreographed to patriotic music that will be broadcast at the park and live on 99.9 FM.